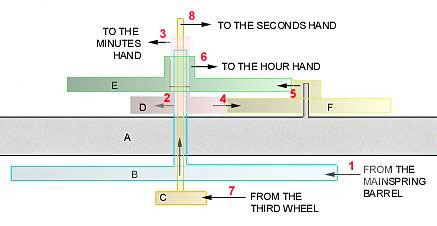 The illustration above shows the motion works of a center-seconds watch. (1) The fourth wheel pinion, which carries the seconds hand. (2) The center wheel pinion, which carries the cannon pinion. (3) The cannon pinion, which carries the minutes hand. (4) the hour wheel, which carries the hour hand. The second illustration diagrams the power flow from movement to hands. (A) The movement plate. (B) The center wheel. (C) The fourth wheel. (D) The cannon pinion. (E) The hour wheel. (F) The minute wheel. You can follow the power flow with the red numbers, 1 through 8.